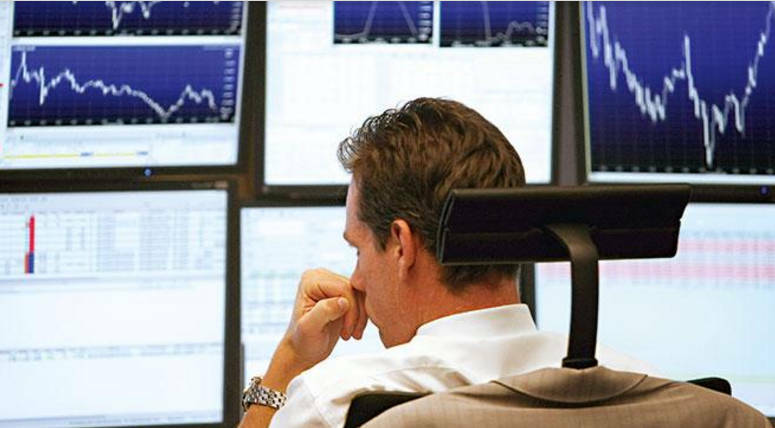 Trading forex is often a very complicated job. There are times that trading is straightforward – it’s magical when the fundamental analysis, technical analysis, indicators, and market sentiment just seem to fall in step. Altogether, they can point up and you buy fast, or they point down and you sell. 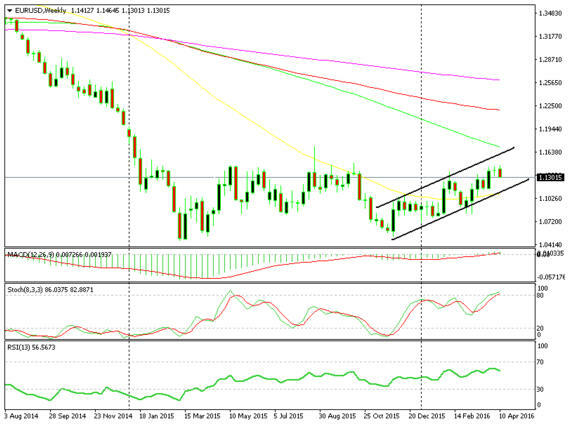 We have seen many such occasions, such as: the EUR/USD downtrend that started in May 2014, the USD/CAD uptrend that was fuelled by the collapse in the price of petrol, and the USD/JPY uptrend which started in 2012. All these moves were very logical; EUR/USD was technically heavily overbought. The economic situation, respectively, was divergent, the European economy was near contraction and the inflation was near zero. Meanwhile, the US economy went through a booming period and the FED was beginning to tighten their monetary policy. In addition, the ECB had just started their Quantitative Easing (QE) program. In fact, the big downtrend started during the May 2014 conference, the minute after ECB president Mario Draghi announced the QE program, which was to begin in January 2015. The situation with the USD/JPY was similar; the Japanese economy was in contraction (it still is) and the BOJ had begun to intervene, both through monetary intervention and policy easing. The Canadian economy was exactly in the same shape as the Japanese economy – and on top of that, the petrol prices were collapsing as we mentioned above. So, all these movements made perfect sense, but even on such occasions, it is difficult to trade. You must carefully pick the levels and be very patient until the price approaches the right level. Then, sell the pair which is in a downtrend after the retrace is over. Even if you go with the flow you might get burnt, since the retrace during such large trends can be quite large and far deeper than your pockets can allow. Trading forex when the market is rational is hard enough. Imagine trading forex when the market is irrational – you’re a lone ranger! We have seen a lot of that lately and that´s why we decided to publish this article ahead of schedule. The three pairs we mentioned above are just doing the opposite right now. All these pairs have reversed by 10 to 20 cents (1,000 – 2,000 pips). Though, if the longer term trends are still intact it’s a retrace. Personally, I think that the longer term trends are still alive and this is just a retrace, but a large one at that. Also, I don´t think anyone could afford such a setback. Well, maybe only the large funds with tens and hundreds of billions in equity. Apart from USD/CAD retrace, which has some logic behind it because the petrol prices have picked up somewhat (the market is pricing in the Doha meeting on Sunday), the recent price action in the other two pairs is completely irrational. So, what can we do in such conditions? Should we stick to our logic or should we go with the flow? And, how can we know how long the flow will last? There’s always the chance we may get in with the flow right before the market comes to its senses and the flow shifts. So, we should be very careful during these times. We must use all the tools available to us, and, in my opinion, we must do both: follow our logic and follow the flow as well. If we leave one of them out it would be like trading based only on technical analysis, leaving the fundamental analysis out, or vice versa. Trading forex is a tough job, you can barely come out on top when you use all the tools you have available – but try leaving half of them out! That´s why we should follow our logic based on the fundamental and technical analyses, but also try to go with the flow. But, how can we do both when they contradict each other? This article should make it very easy, we can do both even when the flow isn’t logical. When the volatility is very high and moves are immense, you have to pick the levels very carefully. These levels define our risk; we rely on them to protect our trades and, therefore, our account. So, we have to look at the larger time frames in order to pick the levels carefully. During such volatile times, the smaller time frame support and resistance levels are just noise to the market, they simply can’t work. So, don’t get tangled up in a network of unimportant levels. When the market has moved illogically by hundreds of pips in the opposite direction of the main trend, and against the logic that the technical and fundamental analysis suggests, it just seems unreasonable that the move would continue much longer in that direction. It’s not logical to go with the flow and open a long-term trade or forex signal after such a move because sooner or later the market will come to its senses. So the best thing would be to find a reliable support/resistance level to define our risk. One such level in USD/JPY is the 107.50-60, where the smooth 200 MA lies in the monthly chart and the smooth 100 MA lies in the weekly chart. It’s a pretty tough nut to crack and with all the fundamental and technical indicators against the recent downtrend, the logic suggests that this will be the end of the fall in this pair. But, we can only use long-term trades or forex signals with this forex strategy because the 40-50 pips stop losses are like dust for the forex market during such times – and we all know that stop hunting always targets weak stops. A reasonable forex strategy here would be to open a long-term forex signal at 107-08 with a stop loss below 1.05, which is another very strong support level. Then we target 110 first, 116, afterward 120 and, finally, 125. In the short term, we are forced to stick to the direction of the flow, although it might go against all analysis and indicators. 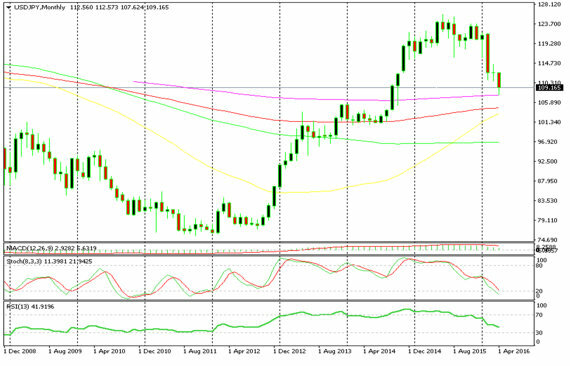 The best forex strategy, in this case, is to sell or to open sell forex signals in USD/JPY after a retrace is over. You can either sell when the price has reached a prior support level, which will turn into resistance or when a moving average (MA) has been broken to the downside and now the price is testing it again, but this time the MA is on the upper side. These strategies are more suitable during normal market conditions but the logic is the same. Of course, you can play with it both ways but only when the market has stabilized somewhat. The chart below shows a period after a large downward move when the market is trading sideways before the next massive move. During this period, we can open both buy and sell short-term forex signals or trades. 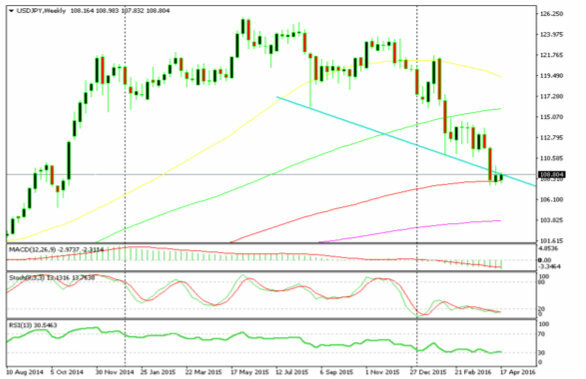 The best forex strategy here would be to buy or to sell at support/resistance levels or MAs. 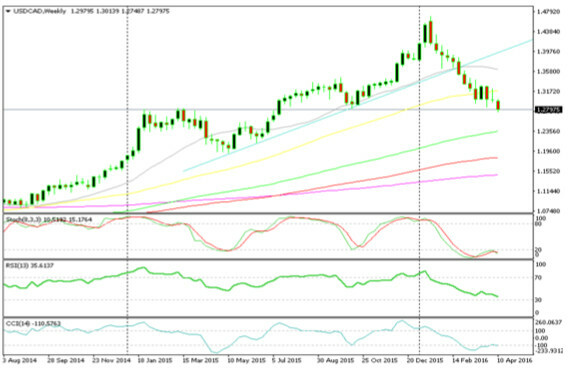 The first trade here would be to sell when the price retraced to the 50 MA (in yellow) after a 400 pip decline. At this time, after such a strong downward move, it would be dangerous to be looking to buy. The confirmation that the illogical decline may be over (at least in the short term) is the failure to break the first low at 107.50s. Only then would we consider buying or opening a buy forex signal, as there were two short-term buying opportunities. Then, we can sell again when the price reaches the 50 MA again with a 30-40 pip target. We can buy when the price touches the 20 MA in grey as it moves up and so on. As you can see, we can trade profitably even at the worst of times. We can´t change the market. Though the forex market can often be a beast, it´s us that have to adapt to it. During times of immense volatility, when the price moves against logic, we can open short-term trades in the direction of the recent trend when the price makes a retrace. We can also open long-term trades which go against the recent trend but fall in line with the larger trend and analysis. But, we must pick the levels carefully and closely follow the price to see how it reacts around these levels. This is how you can successfully trade your logic against the flow.